Earlier last month, the world was raving about the acquisition of world leading messaging app WhatsApp by Facebook at a $19 billion price tag. The acquisition effectively puts WhatsApp as a company more valuable than for example, the American Airlines (US$12.3 billion) – not bad for a company with only 50 employees as compared to the latter’s close to 88,000 workers. While Facebook has explicitly said that WhatsApp will “continue to operate independently and retain its brand”, it has not stopped netizens and bloggers from raising the alarm over how the the former may ruin WhatsApp with ads. Following that too, Telegram, a messaging app with a focus on speed and security, also one of the closest alternative to WhatsApp, has been gaining a lot of momentum, especially when WhatsApp went down. 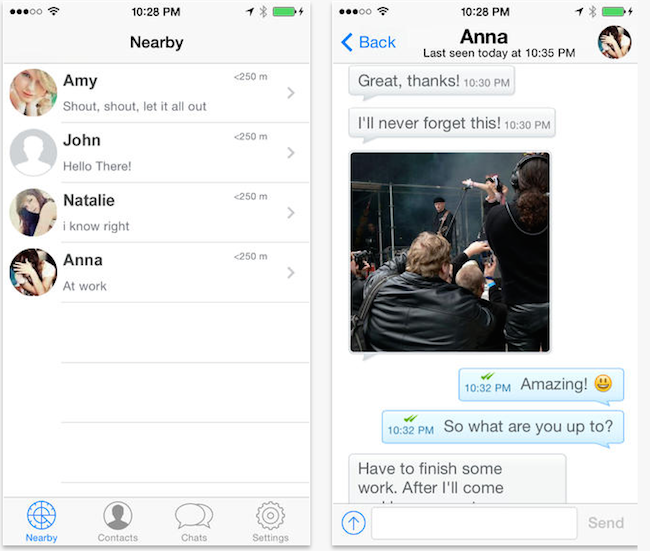 The short downtime sent WhatsApp users looking around for alternatives, giving Telegram a huge boost in downloads. At its peak, Telegram was getting 100 new registrations every second. To put that in context, that was about 800,000 users added in 4 hours, and 4.8 Million users in 1 day. A new similar app recently popped up under our radar too: ShoutMe. A direct clone of WhatsApp, ShoutMe is a cross­-platform mobile messaging app that can be used on the Android, iPhone, Windows Desktop and Windows Phone, allowing you to communicate with your friends. 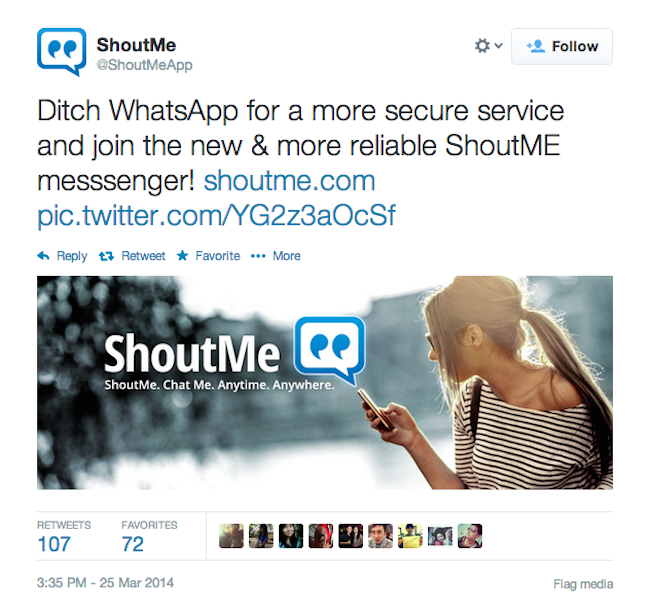 The app clearly resembles the design of WhatsApp, and in one of its recent tweets, it also called out for users to “ditch WhatsApp for a more secure service”, which obviously was referring to ShoutMe itself. According to the website, ShoutMe messages are encrypted and are 100% secure. 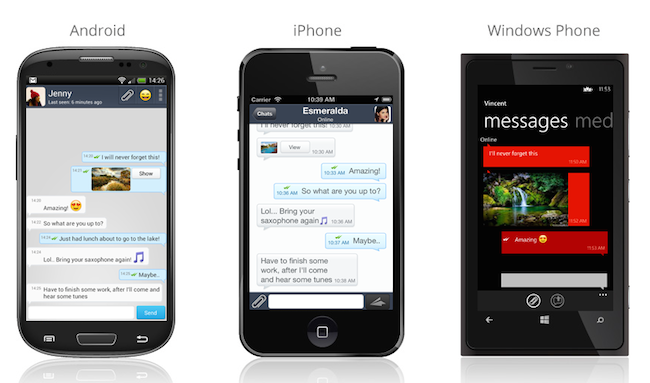 You can gain access to your messages with various devices, a feature which WhatsApp currently do not provide. The new app also claims to have “quicker delivery than any other apps” and will remain completely free. We gave ShoutMe a spin and although it has all the core functionality nailed, you can chat your friends up on the app, but a majority of our friends are already on WhatsApp and other major messaging apps such as LINE, WeChat or KakaoTalk. These other apps offers much more functions such as voice calls and some comes with very fun sticker packs. ShoutMe is definitely fighting a very steep uphill battle.